Publisher: New York: G.H. Doran Notes: This is an OCR reprint. There may be numerous typos or missing text. There are no illustrations or indexes. When you buy the General Books edition of this book you get free trial access to Million-Books.com where you can select from more than a million books for free. You can also preview the book there. 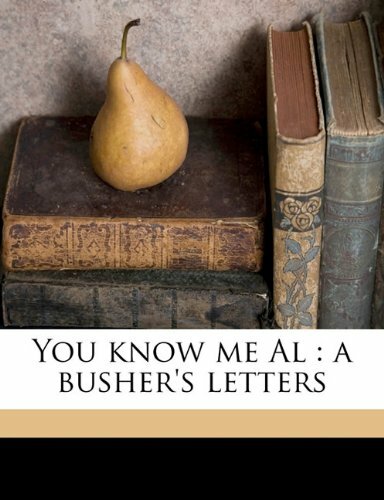 series of letters from Jack Keefe, a fictional baseball star, to his hometown friend, Al. The letters first appeared in The Saturday Evening Post in 1914, and then were published in book form in 1916. Other short-story collections include Round Up, The Busher Returns, Gullible's Travels, and First and Last. Lardner also wrote one novel, The Big Town, and collaborated with George S. Kaufman on the play June Moon, which opened on Broadway in 1929 and was filmed a year later. Ring Lardner died in East Hampton, Long Island, N.Y. in 1933. Lardner's son, Ring Lardner, Jr., is also a writer whose credits include the screenplay for the movie M*A*S*H.